From outside one easily mistakes the place as the entrance of an ancient temple. Two imposing rectangular pillars support a moss covered red tile roof. 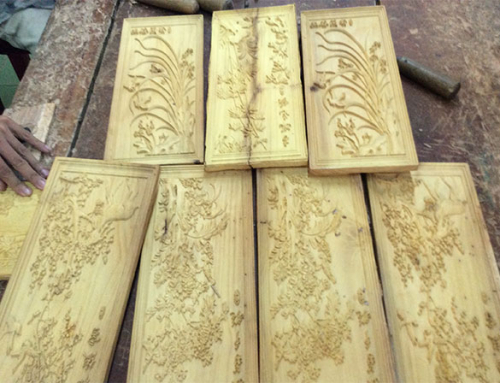 Suspended in the middle from underneath the roof is a piece of solid wood carved the words Huế Thương. To the right of the first pillar, erected a billboard with colorful bold writings in red, sky blue and green: Huế Thương. Quán Chay phục vụ sinh viên Huế. 5,000Đ/Suất. (Love Huế. Vegetarian Eatery, serving Huế students. 50C/Meal. We walked into the simple place at 5:30PM, unannounced after passing a covered veranda for motorcycles and bicycles. Two young students were waiting for their meals in the almost empty restaurant. Six tables and two dozen chairs filled the airy rooms. Chop sticks and spoons were neatly placed in ceramic containers in the middle of each table. Regulations and poems were displayed on the walls across from a royal Huế lantern hung from the middle wall. Tĩnh, from Huế and Huyền from Gia Rai, a province in the mountainous central of Việt Nam, both first year students at a college nearby, were waiting for dinner. They had never been here before. They learned about the place from their friends and wanted to try out. 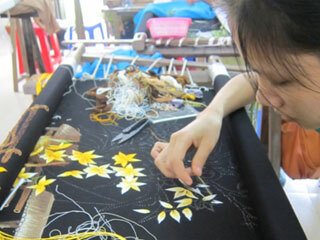 Head nun Phước Thiện greeted us with a gentle smile and took us on a tour of a small but eﬃcient kitchen. Hoà, the head cook, a friendly woman in her mid sixties, patiently supervised three students to set up the food counter. Pointing to the counter, she told us “here are the food we serve tonight: jack fruit salad with peanuts and fried shallots, stirred fried vegetables, braised tofu in dark soy sauce, and fresh water spinach soup. There are always four dishes per meal but lunch and dinner menus are diﬀerent. We try to change them all the time.” Behind the counter, three students busily fill the empty bowls with steamed rice. “Rice is free and they can have second or third bowl. We have to be ready because students will rush in about half-an hour. Today is Saturday so we prepared enough food for at least 120 students,” Ms. Hoà is pleased to inform us. 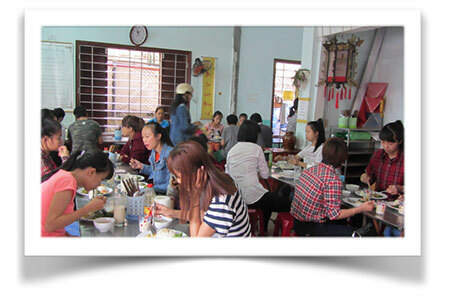 The restaurant, located on Bà Triệu bustling street, has provided aﬀordable meals for several years for boarding students, students from poor families who come to Huế to pursuit their higher education. 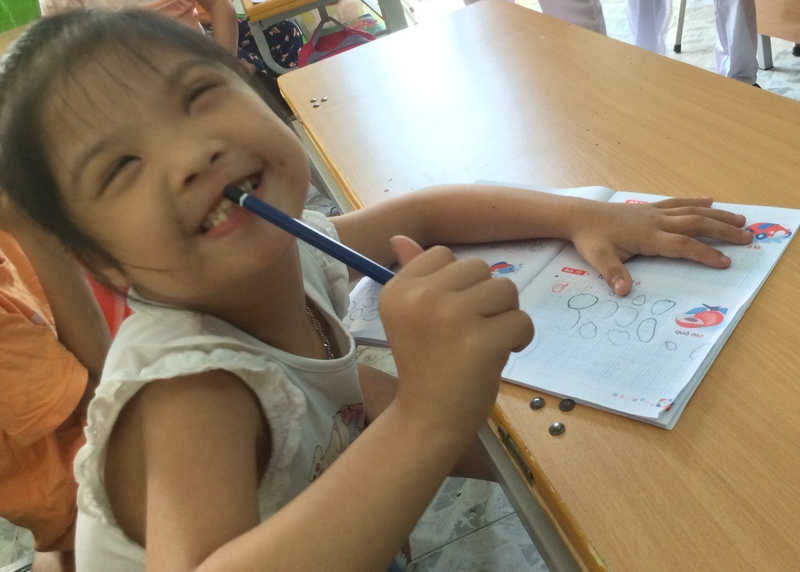 In addition the eatery provides free meals to the lottery tickets sellers who come from Huế’s surrounding villages to make their living. 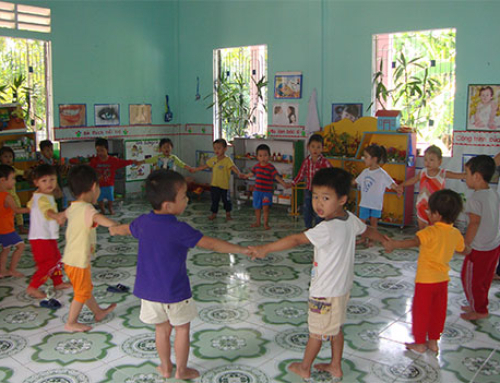 On sunny days, they can make 50,000VND a day ($2.5), on rainy days, 30,000VND ($1.5). Head nun Phước Thiện invited us to enjoy the delicious hot soy milk made fresh daily at the site. 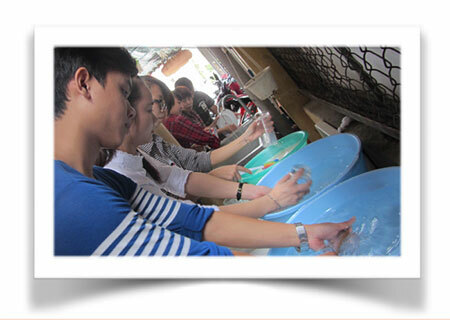 “Students only pay 5,000VND a meal and help wash their own dishes. A meal at the food stand could easily cost 10,000-15,000VND more. So, lots of students come here to eat. Students can have a glass of soy milk for only 1,000VND. We also make fresh tofu here. We don’t use any chemical. We use lemon juice and salt to congeal the soy milk,” she explained. Head nun Phước Thiện has worked here for 13 months and manages the place with efficient help from both volunteers and a paid staff. The head cook, a retired teacher, is in charge of the kitchen and cooks all the meals. She takes a small monthly salary of 3,000,000VND ($150) a decrease from a normal 5,000,000VND for a cook. The head nun not only has created jobs for five students who live away from their families, but also allows them to stay overnight at the site at no cost. They serve food and clean the place after lunch and dinner. They are paid 500,000VND ($25) per month. During the week the restaurant serves 200-220 lunches and 120 dinners. “It’s slower on Saturdays. 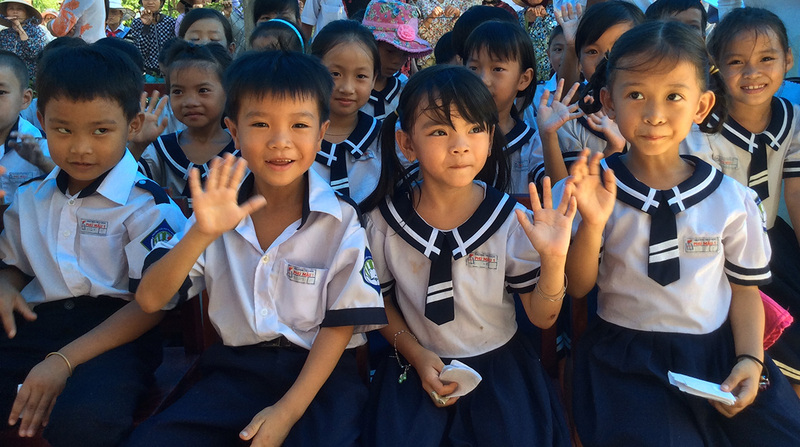 During the full moon we provide about 350 lunches and 150 dinners,” head nun Phước Thiện explained. The income from the meals covers the food cost. “Every day we go to the wholesale market at 3:30AM to get the freshest produce with much lower prices than at the regular local markets.” An anonymous philanthropist has donated 6 tons of rice monthly for two years. The biggest expense is the rent which amounts to 7,000,000VND ($350) a month; water and electricity bills run about 2,000,000VND ($100). “We still have to work hard to have that item donated,” she added. Tĩnh and Huyền finished their dinner and let us know that they liked the food and the soy milk a great deal. Asked if they would return here to eat, they both responded with broad smiles: “We will definitely come back.” With that they stood up, collected the plates, glasses, chop sticks and spoons and headed toward the sink and started to wash the dishes.